Although my students are aware of the concept of Halloween, they have never dressed up in costumes or trick-o-treated or carved a jack-o-lantern. 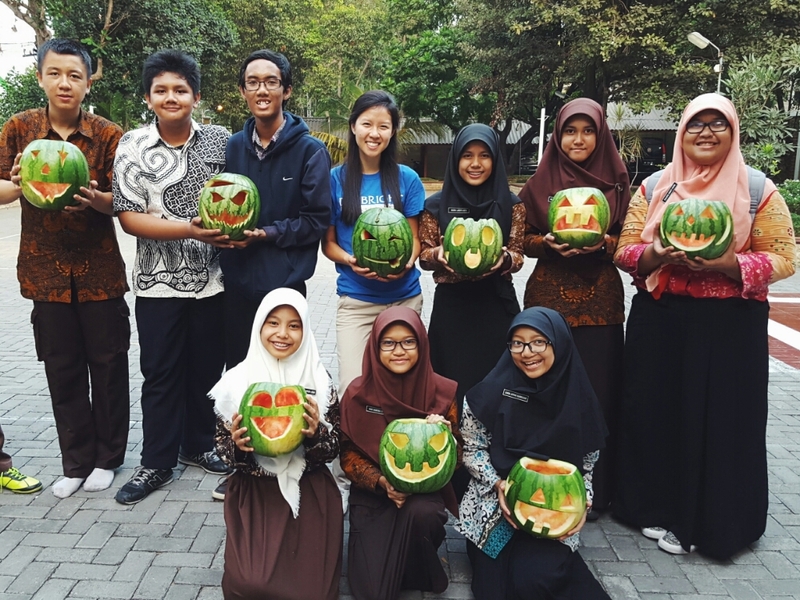 Thus, I give you Jack-o-watermelons by students at SMAN1! 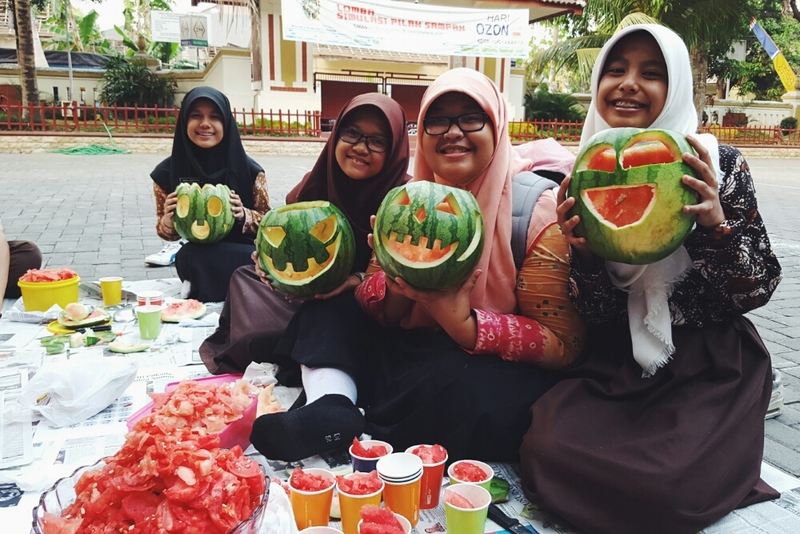 I initially did try to find pumpkins, but they’re small and expensive in Indonesia, and watermelons are not, so we carved ten 6kg watermelons in the front yard of our school afterschool on Friday Oct 30th. 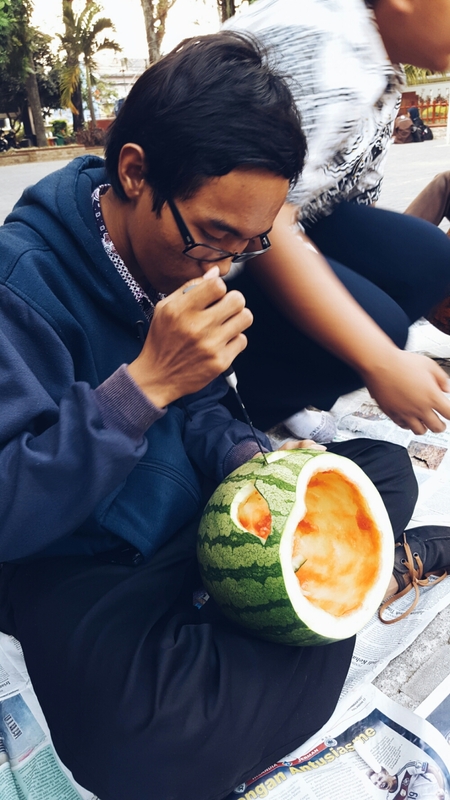 It’s not often that I get to sit down with my students and relax to some tunes while eating spoonfuls of watermelon and talking about what music we like. It was a juicy blast. 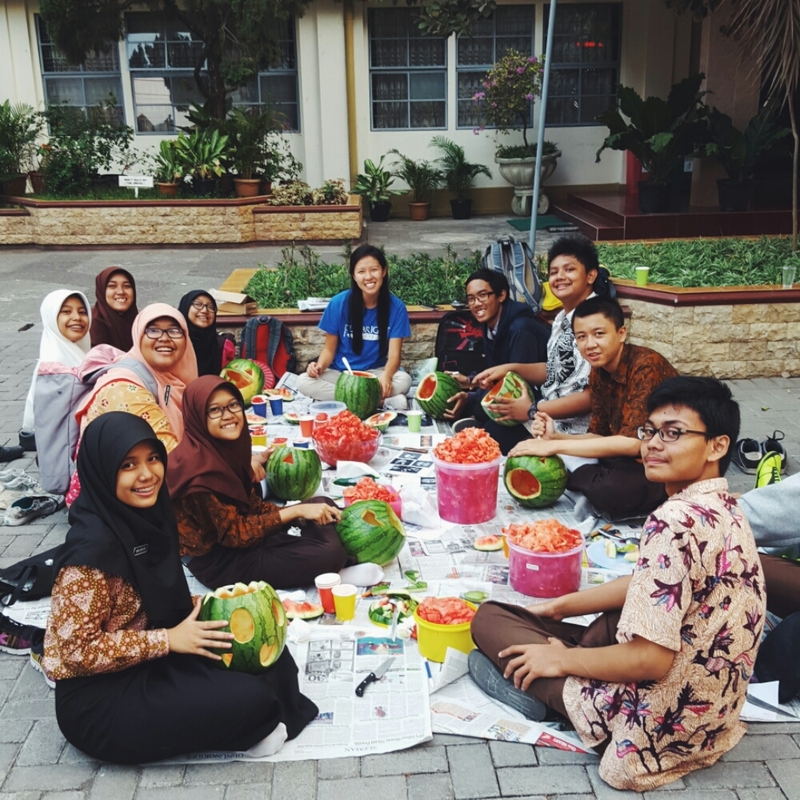 That is ten watermelons full of fruit in those buckets, and what was probably even more fun than carving was running around the school afterwards and finding people to help us finish all the watermelon we had leftover. No tutorial was necessary. They got to work way before I even sat down. Leave it to the girls to finish first. I was ecstatic when Zahra sent me pictures of her jack-o-lantern at home after her parents helped her put a candle in it. I really like how the pink pops out of the green. 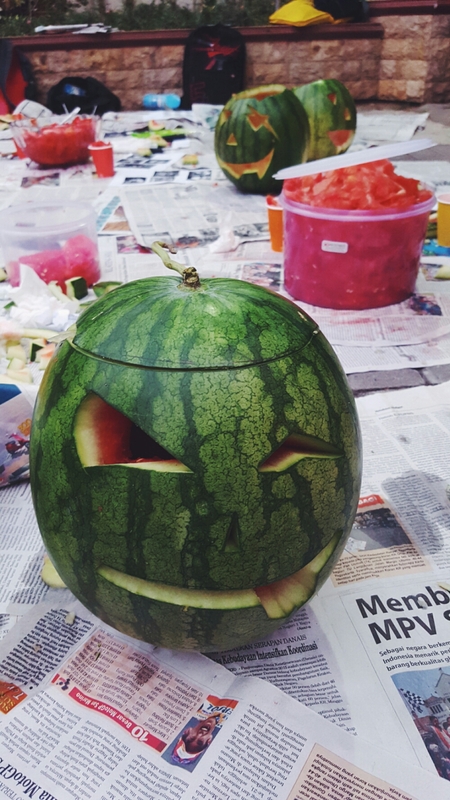 Watermelons > pumpkins. 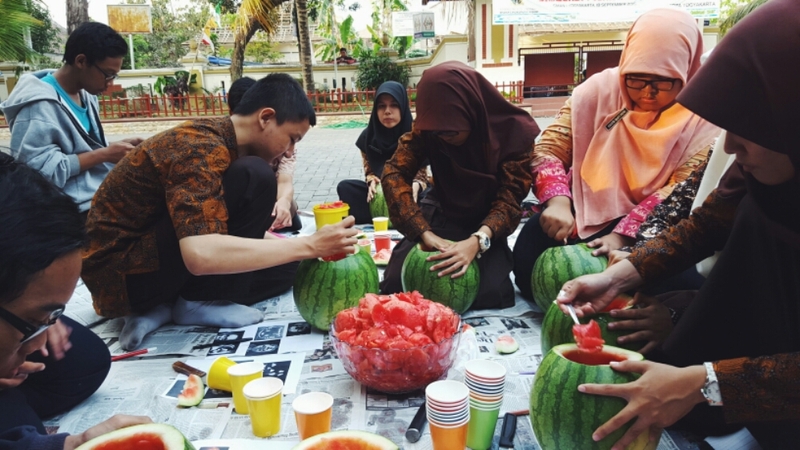 We talked and sipped on watermelon juice deep into the evening, and I found out that hanging out at school late at night feels just as badass here in Indonesia as it did in America. No teachers. No parents. Just friends under fluorescent lights. 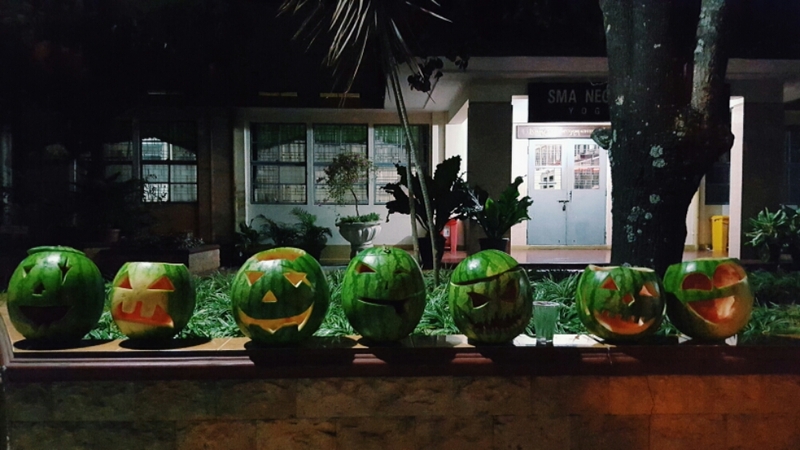 The marching troop was finishing up practice in the courtyard, theater was crafting props in the auditorium, and I was just beginning to get a taste of the night crawlers of SMAN1. All in all, it was a lovely afternoon with some of my 10th grade students, but they’re not easy to get a hold of. 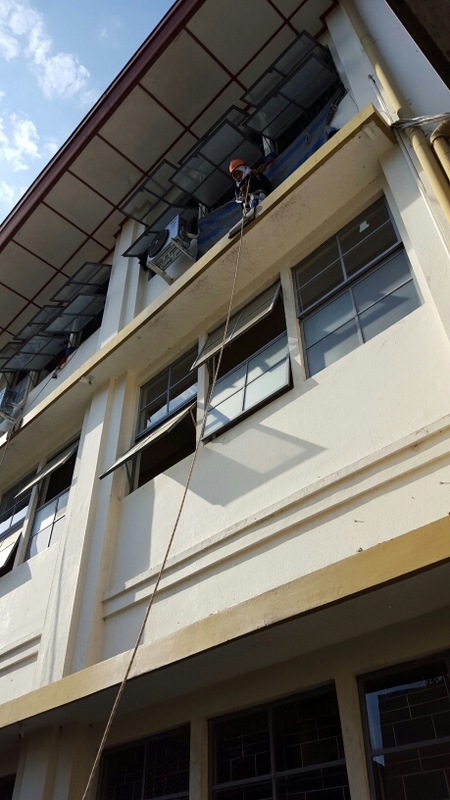 SMAN1 is teeming with extra-curriculars, and the students are very involved outside of class. 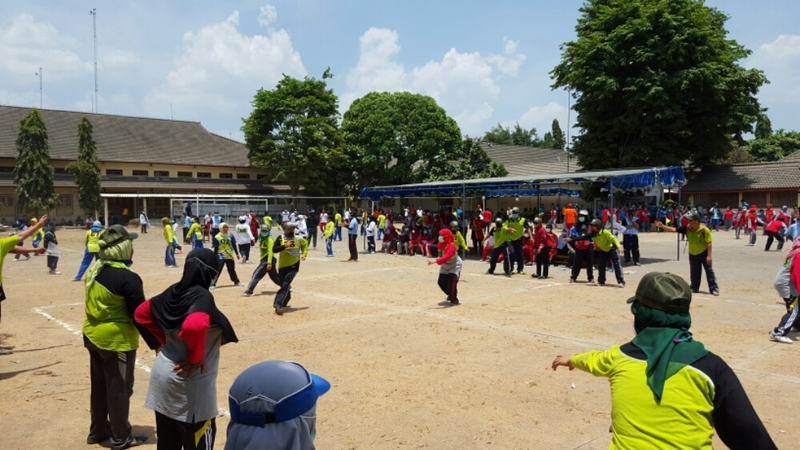 In so far as I’m aware, there’s gamelan, volleyball, badminton, basketball, marching, journalism, science club, a hiking association, tae-kwon-do, theater, Islamic society, and Red Cross. Basically, enough to keep them very busy. 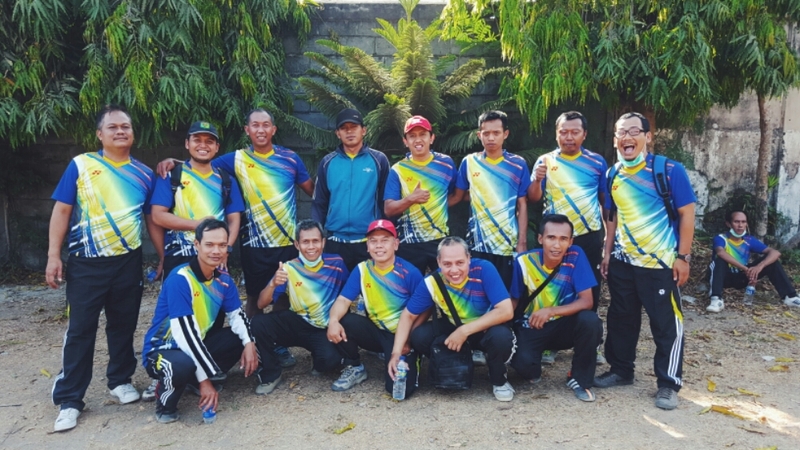 The Teladan Hiking Association practices descending exercises for caving trips. A couple times a year, the students in the hiking association grab harnesses and rope and lower themselves into caves to explore. 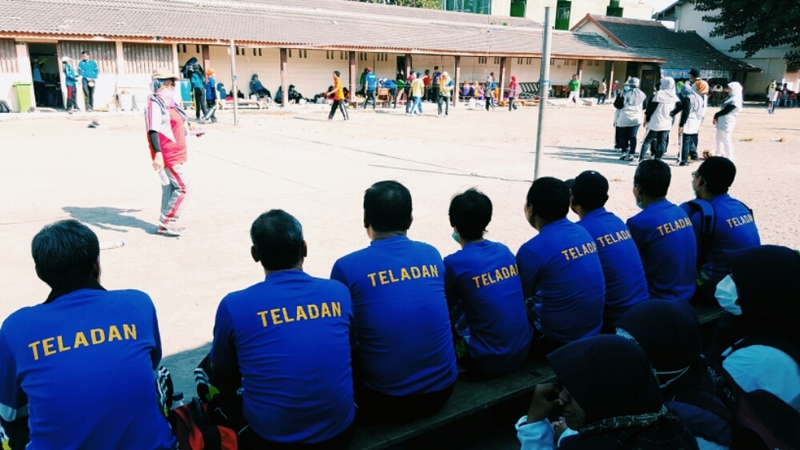 The Teladan Hiking Association also did a demonstration for National Youth Day earlier in the week. 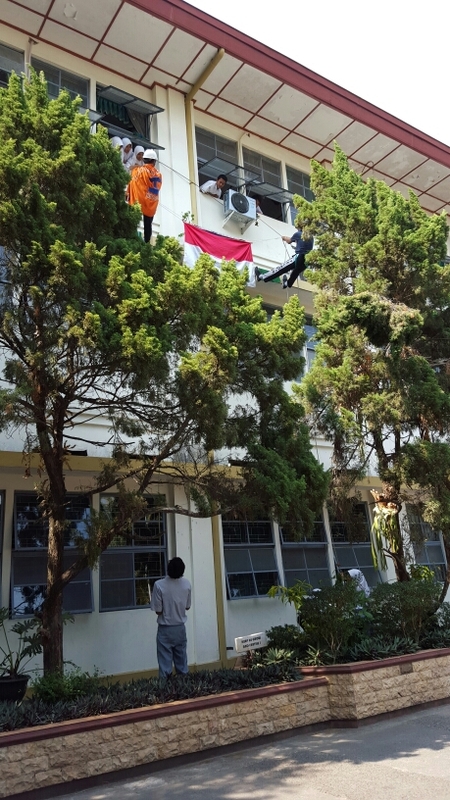 They descended from the third floor with the Indonesian flag spanning their ropes to celebrate the day that young Indonesian heroes took an oath in 1928 to unite the country by speaking a national language. Not only are students super active in clubs, but they’re incredibly musical as well. So many of them play instruments and sing, and they can pull together a performance for many an occasion, including the morning of National Youth Day. What’s amazing to me is that these student clubs and performances are run entirely by the students themselves. Teachers and club advisors played a large role in my high school extra curriculars in America, but here the students take responsibility for running the entire show. The students are usually preoccupied with all the awesome things they have going for them, but I did manage to snag some to go for a rock climbing trip with me at a local wall after midterms. 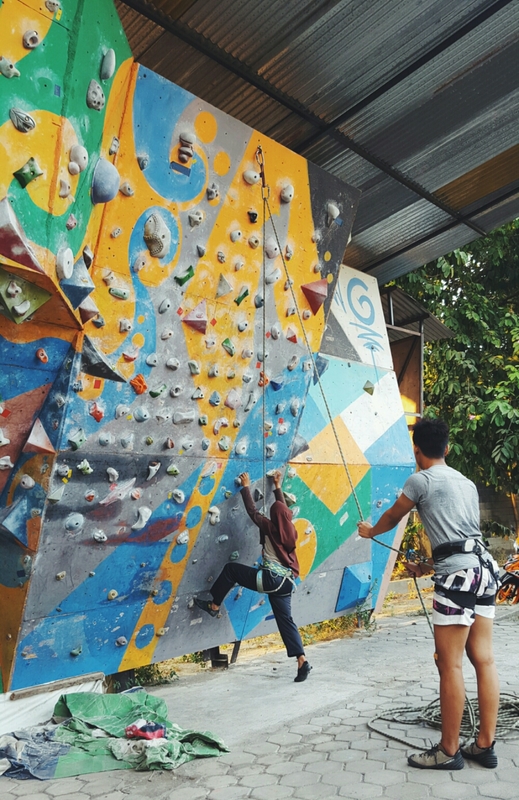 Getting involved with my students has called every activity I have ever dabbled in to the fore – debate, volleyball, rock climbing, etc. It’s been a fun challenge continuously trying to find new avenues to connect with people, and Indonesia has really forced me to put all my cards on the table. It kind of feels like I can be quizzed at any moment. You never know when you’re going to be asked to give an impromptu speech, or when you’ll be asked to come on stage to sing a song, or give a 90 minute lecture on teaching strategies. All I can do is muster every semblance of experience I have collected to this point and turn it into something presentable. 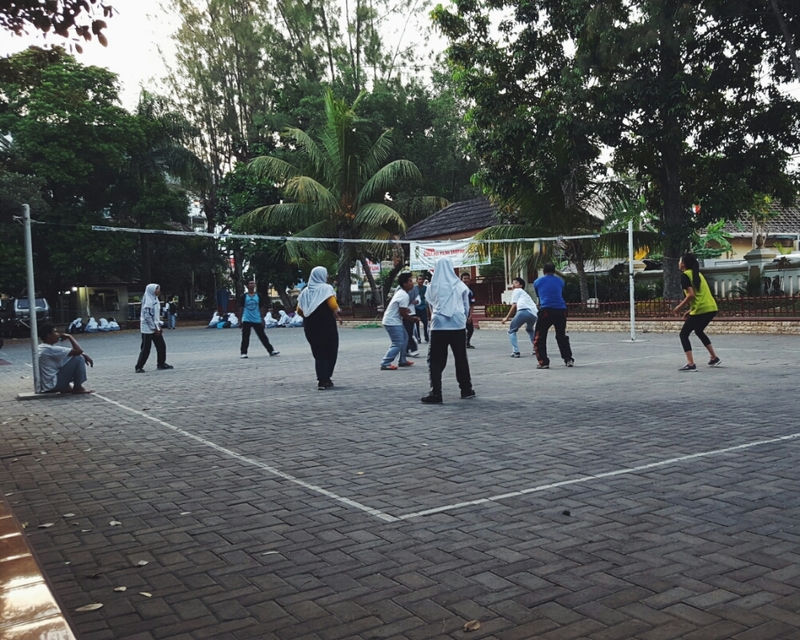 The day after jack-o-watermelons, there was a tournament with teams of teachers from high schools all over Jogja playing volleyball, ping pong, badminton, and Gobaksodor. 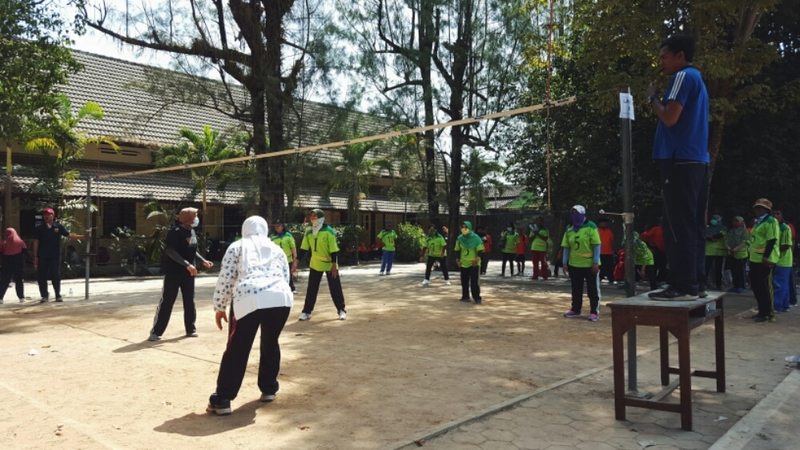 There were loads of teachers, lots of sportsmanship, and tons of laughter. A game of guarding your square while the other team tries to run all the way through to the other side without being touched, and you can only move back and forth on your side of the square. This game is a hit amongst Indonesians It’s fun, it’s fast, and looked real tiresome. Kind of like tag, but the person who’s “it” is limited to a line and the runner gets to tease them a bit before making a run for it. The title refers to having to run to the end and “back to the door” of the square without being touched. Do not underestimate these Ibus. They were pretty damn good at volleyball. The women teachers from my school were not. But it was all in good fun!! Waiting for our turn to play. Outdoor games on dry dirt leads to lots of dust, hence the masks. 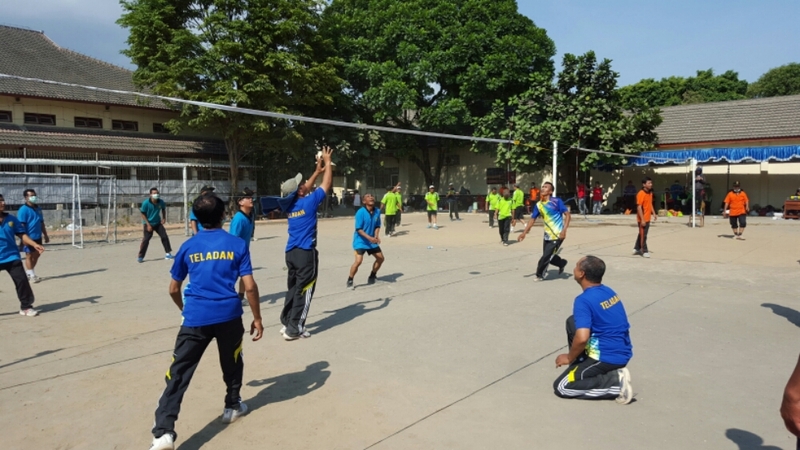 The mens volleyball team from SMAN1! Bump set spike. 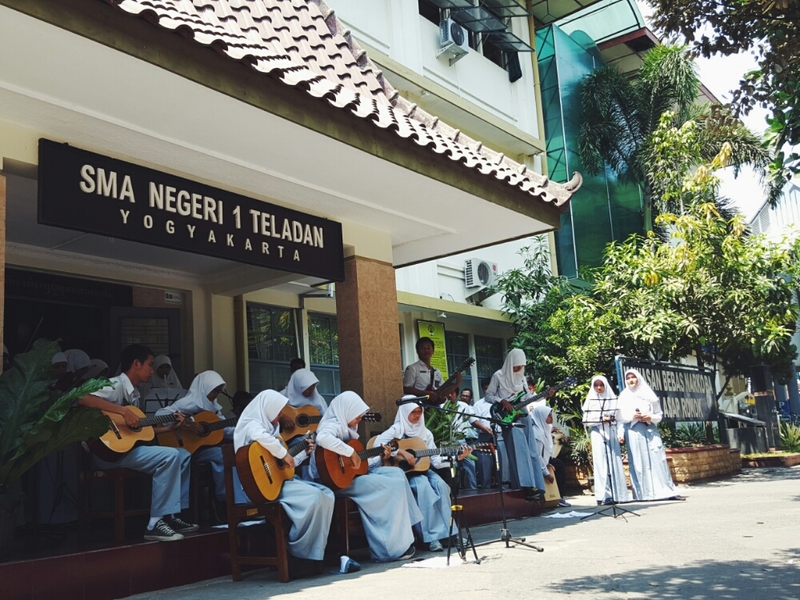 The full name of my school is SMA Negeri 1 Teladan. 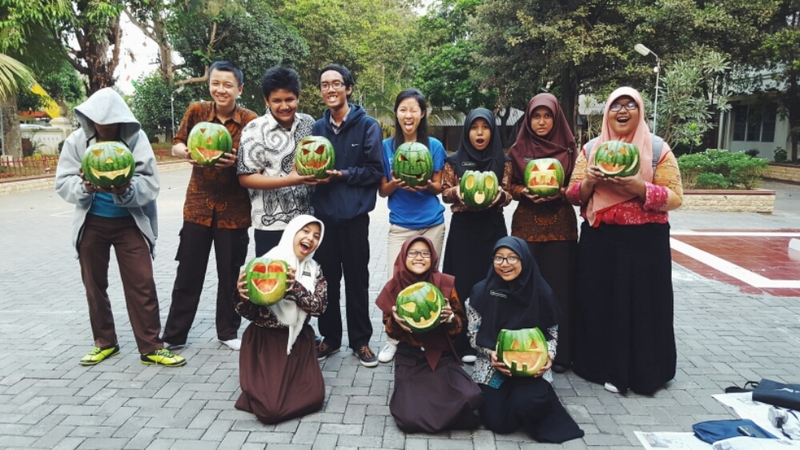 Teladan is Indonesian for “role model”, and boy do these students (and teachers!) live up to the name. It’s a very versatile word, and I’ve found that it’s one that resonates pretty deep within Indonesian culture. Indonesians never lose spirit. They’re always smiling, always laughing, always cracking jokes and always looking up. One of the most common phrases that I hear every day is “tidak apa apa” (no worries!). I feel like a really large part of why I don’t feel homesick yet is because I am surrounded by so much positivity all the time. Moving across the world and jumping into a new language and culture isn’t difficult when everyone around you is always easy-going and happy you’re there, and for that, I’m extremely grateful to be in this country. 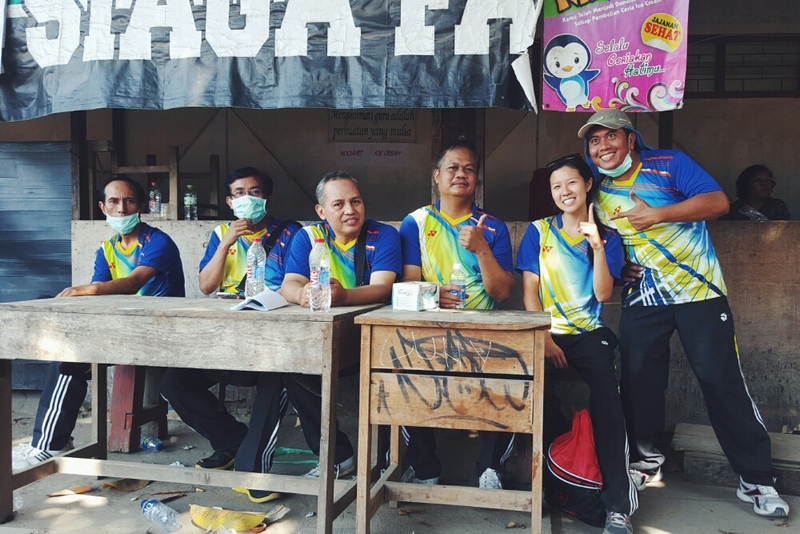 Indonesian people inspire me to patient and optimistic, and it’s an attitude makeover that is changing my physical and mental health for the better.